This is plush and seamless, a board white brimming with apricot fruit fully backed with umami richness. There's acidity, but it's only perceptible in the juiciness of the fruit; otherwise it has the lofty firmness of a four-star-hotel bed. The salinity of its mineral tones and the toasty, nutty edge or roussanne gives the wine a complexity that brings to mind a great Alpine cheese. It would take a croque monsieur into a different stratosphere. 80% Roussanne (40+ years old), 15% Grenache Blanc and 5% mixed. Still quite embryonic on the nose at first but then it opened out very beguilingly. Heady stuff and then really opens out on the palate. Great spread across the palate. In its charming first flush of youth. (Why wait?) Powerful. But balanced. Blossomy with a streak of something more like gorse blossom than minerals. Clean palate scrub on the end. Juicy up front, with lively star fruit, peach and yellow apple fruit, this turn plush and languid with allured grilled hazelnut, sweetened butter and warm piecrust notes filling on the finish. Sneakily long, thanks to the nicely integrated acidity. The 2010 Chateauneuf du Pape Blanc (80% Roussanne and 20% Grenache Blanc vinified in tank) exhibits very good acidity along with a lighter, more delicate style than previous vintages (malolactic is now totally blocked), and restrained orange peel, tangerine oil, white peach, honeysuckle and candle wax notes. This medium to full-bodied, zesty, fresh wine is still backward and unevolved, so cellar it for 1-2 years and drink it over the following 10+. A blend of 80% barrel fermented Roussanne, 15% Grenache blanc, and 5% other varieties, the 2010 Château de Beaucastel Châteauneuf-du-Pape Blanc would most likely be the white of the vintage if it wasn‟t for its sibling. Boasting fantastic aromas of grilled peaches, apricot jam, subtle buttered toast, and wet stone like nuances on the nose, the wine is medium to full-bodied with a layered, rich texture, superb freshness, and a very long finish. Like the Vieilles Vignes, this should be consumed during its first 3-4 years, and then after a decade. It should age brilliantly for decades. Château de Beaucastel Blanc 2010 révèle une grande intensité, la richesse et la longévité potentielle de ce millésime. Pale yellow. Fresh melon, pear and candied ginger aromas are deepened by a hint of honey. Tightly wound lemon curd and orchard fruit flavors open up with aeration, displaying deeper orchard fruit and melon character while maintaining vivacity. Leaves tangy mineral and lemon zest qualities behind on the long, focused finish. 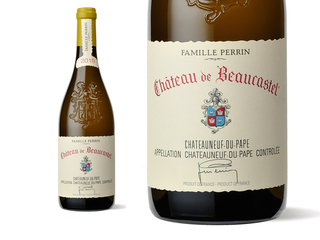 The 2010 Beaucastel Châteauneuf du Pape Blanc is slightly more closed than its 2011 counterpart, as it has been in the bottle for nearly a year. Again 80% Roussanne and 20% Grenache blanc vinified in tank, the wine displays the tropical fruit notes intermixed with rose petals, crushed rock, spring flowers and a rather exotic, somewhat tropical character, but tangerines dominate the fruit spectrum.